Fontana del Papa is a bed and breakfast and cooking school near Rome in the idyllic and charming countryside location of Monti della Tolfa. But this would be a understatement. It is, in fact, a wonderfully rustic home dating from the 16th century in what was, until 2000, an abandoned farmhouse set amongst equally abandoned olive trees. Beautifully and tenaciously restored by owner Assuntina Antoncacci, Fontana del Papa today has become a relaxing retreat where to enjoy the Lazio countryside and traditional way of life as it once was. You will feel like part of the family, where guests eat meals together in typically Italian fashion at a long table. The rooms are bright and spacious rooms and are evocatively named "Ginestra", "Fragola" "Pungitopo" and Olivella", as well as "Fontana del Papa", a junior suite with open fireplace and independent entrance with a queen- size four-poster bed. All have a private bath for privacy and comfort and all have terracotta floors which are heated in winter. If you are coming as a large family or friends then consider "Pungitopo" which shares a sitting room with fireplace with La Fragola. Magnificent paintings by a gifted, local artist adorn the walls throughout the entire home. Outside you cannot avoid the panoramic view, and what a setting for the swimming pool! Rates include gourmet breakfast and a free mini bar in the kitchen. Children 9 years or less stay free (one per adult) All Credits Card sare accepted. - 'The Past and the Pasta' by Assuntina and her incredible story of buying and opening Fontana del Papa. The cooking classes offered by Fontana del Papa are something else and after almost 20 years feature in the Top 10 list of Cookery Schools in Italy in National Geographic's book - Food Journeys of a Lifetime. The lessons take place in the kitchen of Fontana del Papa and can be booked as day classes or short breaks. The day cooking lessons are particularly suitable for cruise ship visitors seeking an alternative excursion or day out near Rome away from the hustle and bustle of the Eternal City. If arriving at Civitavecchia, note that there is also a free shuttle bus which will take you from your ship and onto Fontana del Papa. Classes are limited to 6 participants. After lunch, you can request a short guided walk through Tolfa to the Castello della Rocca which looks over the town. The 12th century castle may be a ruin now, but the view of the Lazio countryside is still breathtaking. 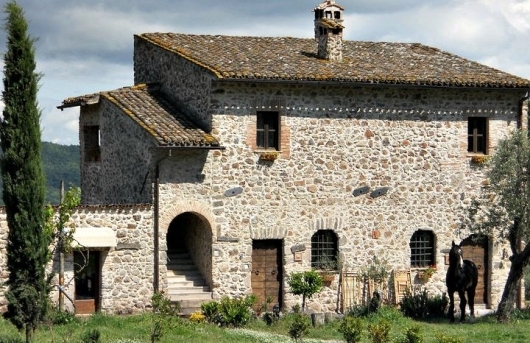 • Visit Tarquinia or Cerveteri and view ancient Etruscan remains and Museum. • Full day in Rome on your own by train.